Robbins Laser Site is the first center in the Rochester, New York area dedicated exclusively to laser vision correction. Dr. Allan Robbins has over 15 years of experience performing all types of refractive laser eye surgery. 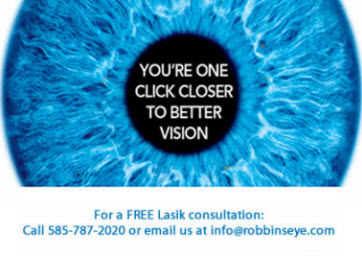 At Robbins Laser Site, recommendations are made after a thorough evaluation of your needs. Then the procedure that best fits your individual needs is recommended. Dr. Robbins introduced flying spot lasers to the Upstate New York area. In 2001 he was the first laser eye surgery specialist in the area to combine the precision of a small flying spot laser with an active eye tracker. The LADARVision� 4000. LADARTracker� is the only active tracking approved by the FDA that is clinically proven to improve outcomes. Active tracking is a vital part of the equation that has allowed us to move the visual goalposts beyond the 20/20 level! The LADARVision� 4000 is FDA-approved to treat nearsightedness and farsightedness, with or without astigmatism as well as mixed astigmatism. Dr. Robbins is proud to be the first laser eye surgery specialist in the Upstate NY area to introduce the latest breakthrough in laser eye surgery technology, CustomCornea�. Dr. Robbins is one of the first surgeons in the entire Northeast able to offer a customized laser treatment based on the total focusing error of the eye. Wavefront-guided treatments address both the lower and higher order optical aberrations of the eye. Clinical trials have shown that this translates into a better quality of vision, particularly in low light or low contrast situations. Email Us: At the Robbins Laser Site in Rochester, New York, laser eye surgery specialist Dr. Allan Robbins will recommend and provide the laser eye surgery that is right for you. Dr. Robbins recommendations are made after careful consideration of all of the options available for your laser vision correction surgery including CRT, CustomCornea, Ladervision, Laderwave, Lasek, Lasik, PRK, RK, Technolas, VISX or Wavefront. For laser vision correction eye surgery in the Upstate New York area, Contact Us to schedule your free laser eye surgery consultation with Dr. Robbins. This website is not intended for viewing or usage by European Union citizens.